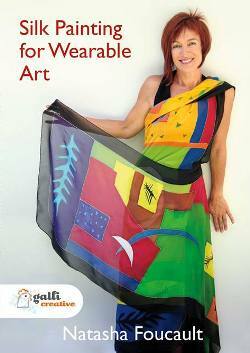 Natasha Foucault works on a variety of silk frames and fabric sizes to produce wearable art. This is an ideal workshop for those interested in silk painting for wearables, as well as those wanting to make a living as a textile artist. Suitable for all levels of silk painters, along with those interested in textile arts, fashion and fabric design. This new DVD features 1.5 hours of video tutorial and a 165-page PDF "Workshop Companion" book filled with colourful illustrations, detailed instruction and more. There are 4 projects included as well as PDF design templates. The course shows you how to paint scarves and loose garments such as ponchos, and uses steam-fix dyes with gutta outliner and other techniques. In English with English subtities available. Free postage is for the UK only - if your order is from other countries we will contact you with shipping cost after we receive your order.